I hardly know where to start. As I write this from Gatwick South Car Park after a 5hr drive from Goodison, and with another 2.5hrs to drive home to Nottingham, by rights I should be exhausted. But I’m still as high as a kite, and only one coffee stop has helped – it’s all down to the unbelievable performance of Everton Football Club against Arsenal, and the fact that I’m starting to dream, to hope. Dangerous thing that ‘hope’ as a Blue! I’ve been willing us to put together a full 90 minutes like that ever since we showed what we were capable of in the first half at the Old Lady against The Bar Codes, and it is all the sweeter that it came against fellow 4th place jousters in Arsenal, and not against someone like Stoke. All the sweeter after our Cup exit to the Gunners, all the sweeter for our reduced allocation of tickets for that game too. As the match begun, I soon noticed Lukaku lurking out on the right, and I had to check my programme to see that I hadn’t travelled back in time and DM was still our manager. A striker out wide? Very much old school Moyes. But RM clearly knew what he was doing, setting Big Rom up against a feeble Monreal, leaving Sehr Sack O’Shitter clueless as to what to do, and creating acres of space for a lively, buzzing Naismith to give an object lesson in ancillary striker or No10. He was immense, and Arsenal defenders were, well, not. A sublime tactical move by my Man of the Match, Roberto Martinez. The second master stroke was leaving Barkley on the bench for 5 minutes. Poor old Ossie, you’ve probably seen his shiner! In fact, it was his ill-timed and injurious tackle that not only saw him leave the game, but also set the tone for how Everton bit in to tackles when it mattered; although they also frequently let Arsenal play pretty patterns when it didn’t. Barkley emerged to roars, and had an outstanding game and I hope Roy was watching this week as well as last. He was hardly alone in his standard of play. Tim was top drawer on the handful of occasions he needed to be. Baines was frequently up and down the left especially when the isolated Arsenal defenders were stuck behind him. Stones looked even better than ever – he is improving every game, and provided he doesn’t try too many more dribbles out of defence like the one where he got caught out, he’ll be a great. A real great. Are Phil Jones and Chris Smalling really better? Just stop reading your rave reviews John, and get on and play. Distin continues to be our rock. I think he liked the Goodison roar too. He never looked troubled by Giroud or Podolski, and his influence on the aforementioned Stones cannot be underestimated. Coleman. Oh my. Oh my effing my. Immense too. Whether it was his hurling-esque, keepy-uppy run from his own box, or the Messi-esque turn to bamboozle Sagna and Vermaelen, he just looked incredible on the ball. He isn’t taking players on as much as he has, but he’s being doubled-up, so he plays the ball to the man in the resulting space. Clever lad Seamus. Barry was his usual self, and if we don’t sign him we’ll be mad. I bet Wenger wishes he’d signed him because sure as hell Arteta can’t do that job. McCarthy was everywhere. How much ground does that man cover every game? One minute fetching and carrying from the back four, the next harassing their DMs, the next shuffling over to cover Seamus. Ginger Jim is my player of the season, let alone his master class today. Mirallas, yep, another top drawer performance, looking fresher after RM has rested him a bit. And as I said, Barkley – superb. Lukaku – amazing. 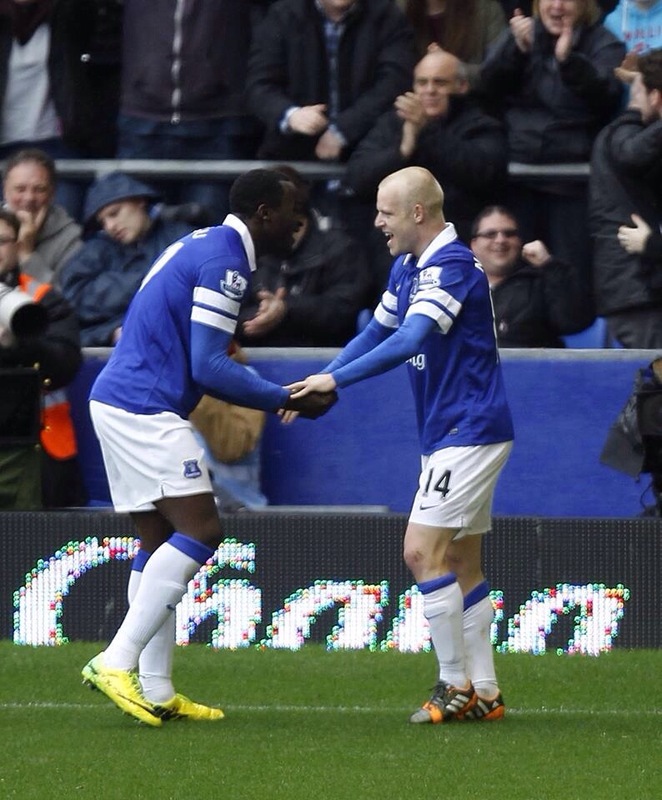 Naismith – wonderful, so pleased for the lad, and so pleased to be proven wrong. He IS Premier League standard, very much so, and my hero Roberto has found the lad’s strengths and plays to them. Even McGeady looked on top of his game in his short cameo. Tonight, I’m one proud Blue. Hope springs eternal and all that, let’s just hope it springs us a win against a dangerous Sunderland – no complacency please. We could be 4th by Saturday tea time. There’s that hope thing again. Go on Everton, break the habits of most of my lifetime.